Welcome to our complete guide to the best organic dog shampoo. We’ll explore the science behind the use of organic shampoo and provide in-depth reviews. Helping you to pick the right organic dog shampoo for your pet. Everyone wants to provide their pooch with the best life possible. This often includes giving them with the top food, bedding, toys, and yes, shampoo. Everyone knows that even the cleanest dog is going to need a bath eventually. They’re dogs! They get smelly! However, when it comes to picking out shampoo, things can get complicated. Before we jump into the specific shampoos, however, let’s look at the benefits of using organic products. In an attempt to purchase the best-of-the-best, many dog owners are turning to organic dog shampoos. But is there any actual benefits to organic soap? Well, there certainly is when it comes to the environment. There is a lot of misunderstanding surrounding what organic products actually are. But at a basic level, organic products are made using environmentally friendly methods. They promote biodiversity, natural cycles and good soil biology too. Organic products are often more biodegradable than other more-synthetic shampoos too. While normal shampoos don’t really cause a great deal of harm to the environment, every little bit can help! So know you know what we are looking at, let’s take a look at the best organic dog shampoo options currently on the market. Oatmeal shampoo comprises of oats that are ground into an extremely fine powder. When you wash your pet with these oats, it moisturizes and softens your pet’s skin. Because oatmeal can be so helpful on a pet’s skin, it is pretty common to find it in shampoo. Here are our top picks for the best organic dog shampoo with oatmeal. This shampoo and conditioner is actually made for all pets, so you can get more bang for your buck if you have multiple pet species! This formula is advertised to be PH balanced for sensitive skins. It is specifically formulated for pets with allergies to food, grass, and flea bites. If your pet has any of those problems, this might be your best bet! Firstly, I just have to point out that this shampoo comes in a container shaped like a dog bone. How cute is that! In other words, it should be okay for even dogs with super sensitive skin. This shampoo is completely vegan and organic. It provides an in-depth skin and coat treatment for dogs with sensitive skin. It also contains a number of essential oils to both make your dog smell good and leave their fur nice and shiny. However, it does contain some of the harsher chemicals that the above shampoos were free of. Does your pooch have sensitive skin? Many dogs, actually, can react negatively to certain chemicals found in regular dog shampoo. Furthermore, some canines just have sensitive skin in general! My mother-in-law’s dog, for example, almost always has red, irritated skin. She just itches and bits and scratches! She’s scratched so much that her fur as even started to fall out! If this starts happening to your pooch, it might be time to change. 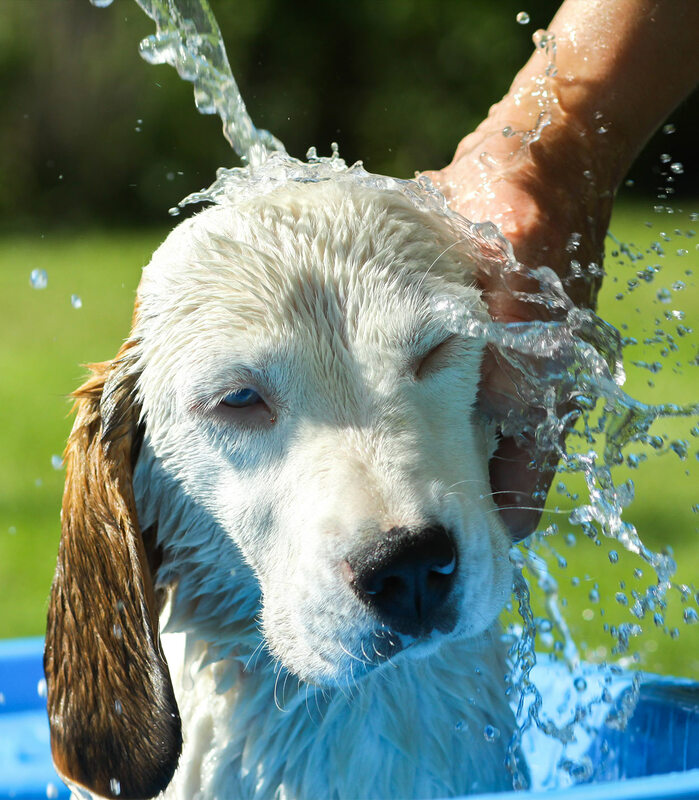 Here are our picks of the best organic dog shampoo products for sensitive skin. This certified organic dog shampoo is detergent-free, paraben-free, and sulfate-free. This is also one of the best organic for dogs with skin allergies, because it is hypoallergenic. The product is also veterinarian recommended and is one of the best organic dog shampoos for itchy skin as well. This Moosh dog shampoo is also certified organic. Plus, it contains Bentonite Clay, which is advertised to naturally help clean your dog of bacteria, fungus, toxins, and heavy metals. Furthermore, it is specially formulated to promote the PH balance of a dog’s skin. It is also concentrated, so a little goes a long way. It also contains essential oils to leave you pup smelling amazing! No time to wash your pup? Then you might want to consider a dry shampoo. Just like it sounds, a dry shampoo is made so that you can clean your dog without actually getting him or her into a bath. This can be useful if you have a busy schedule or just a messy canine! So let’s check out the best organic dog shampoo choices. This dry Bodhi Dog shampoo is particularly formulated for sensitive skin and dogs with allergies. It is completely detergent, alcohol, parabens, sulphates, and Ethyl free. Furthermore, it comes in two scents: Lavender and Lemongrass! It is also okay to use on multiple species, including ferrets and rabbits, so this shampoo might particularly be for you if you have multiple pets. It is even okay to use on horses! However, this shampoo is not certified organic, so there really isn’t any guarantee that it doesn’t contain some chemicals. This Paw Choice formula is made with coconut, and is decently mild. So it can be used even if your pet has sensitive skin. It is advertised to be both quick and easy. And is said to be good for both elderly pets and active, smelly dogs! It also has a satisfaction guarantee, so you have nothing to lose for trying it! Who doesn’t like the smell of lavender? Some of the shampoos we mentioned above smell like lavender, but here is our list of those that smell particularly dreamy! This BarkLogic shampoo comes in a couple different scents, including lavender! It is not, however, certified-organic, but is advertised not to contain any harsh chemicals. It is also said to be “plant-based”. Plus, it is hypoallergenic, cruelty free, and vegan! This Bodhi Soothing Gentle dog shampoo is made for owners who love the smell of lavender, but whose dogs have sensitive skin. It is both great smelling, and won’t irritate your canine’s skin. Choosing an organic shampoo for puppies can be difficult. They are just so active and messy! Plus, there is the fear of a reaction to specific ingredients. 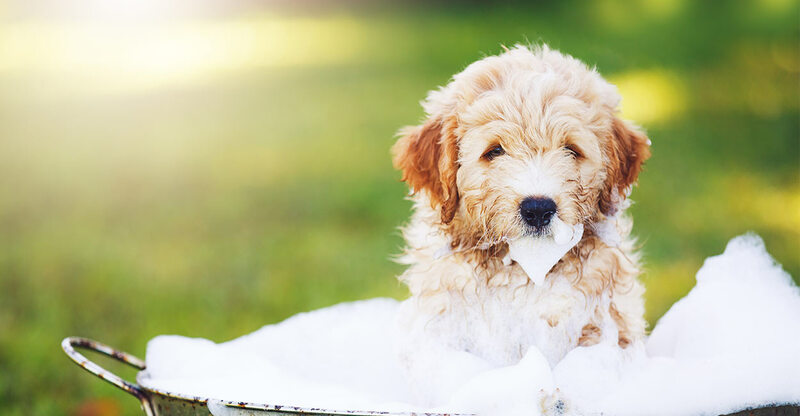 Here’s our top pick from the best organic dog shampoo for puppies. This Kin Kind dog shampoo is made specifically for puppies. It is natural and certified-organic, as well as being hypoallergenic. So you don’t have to worry about any unknown allergens for you puppy! Oh fleas. They really are the pests of the dog world. This organic dog shampoo is, as the name suggest, a bar of soap. However, this is actually easier to use because you don’t have to deal with dripping soap when trying to wash your dog. Plus, it combats fleas, ticks, and lice while also being gentle on your bet’s skin. It smells pretty nice too! There are countless dog shampoos to choose form depending on your pet’s particular needs. The best shampoo is really whichever one ends up being best for you and your canine. What do you like about it? Let us know in the comments below! Scott, Matthew. 2000. “The biodegradation of surfactants in the environment.” Biochimica et Biophysica Acta (BBA) – Biomembranes. Winter and Davis. 2006. Organic Foods. Journal of Food Science. Yiridoe et al. 2007. Comparison of consumer perceptions and preference toward organic versus conventionally produced foods: A review and update of the literature. Renewable agriculture and food systems.